With their eclectic and original design, they are highly suitable for live music. Our first booking in the Haymarket Hotel was for Jem and Clarissa’s wedding. They loved the jazz clarinet trio and booked them in the classy surroundings to play a lively mix of jazz with a few quirks like the Jungle Book and a bit of slightly more funky Herbie Hancock amidst the jazz standards. The photo featured here is by the very talented Joanna Nicole who photographed this elegant and stylish wedding. Another notable booking was a spring wedding in the Ham Yard Hotel on its chic rooftop. Mihaela and Raymond’s choice was for flute and guitar – a slightly unusual but elegant combination which works perfectly for small outdoor events. With their mix of classical, jazzy and more modern tunes it’s a lovely summery sound. Joanna and Phil chose Number Sixteen in Kensington for their summer wedding venue. The weather was mild and sunny so the reception was outside in the beautiful tree-filled garden. 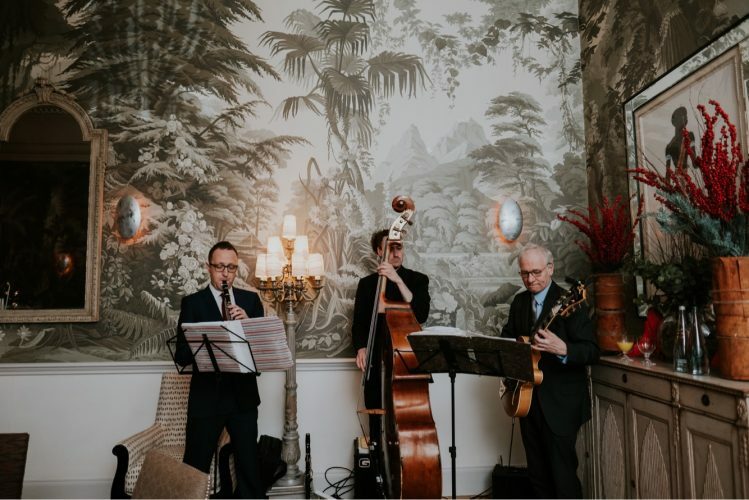 Following a few suggestions from us, the couple chose a jazz saxophone trio who played a fabulous selection of jazz classics to keep guests entertained and create a cool atmosphere very much in fitting with such a stylish venue. Joanna requested a jazzy version of Happy by Pharrell to be played which was fun and toe-tapping! We love to provide exactly the right music to our clients to match their occasion – and most importantly to help them enjoy their event even more on the day with the excitement of great live music. We’re always happy to work in new venues, but there is definitely an advantage to us of having played in the same venue a number of times. This means we know first hand what music really works in different rooms and the acoustics of the particular venue. Working in the Firmdale Hotels is an absolute pleasure as they’re such gorgeous spaces. If you’ve not been and you’re thinking of holding an event somewhere with amazing modern British design, we’d urge you to check out these sublime hotels in London. Get in touch to discuss your requirements for live music.